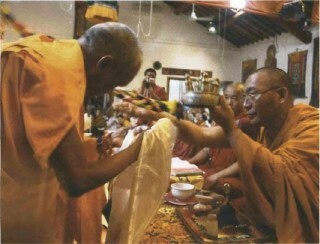 Long life puja for Dagri Rinpoche. Photo by Ven. Henri Lopez Kunsang. Firstly we welcomed the relics with the traditional ceremony due a high lama – clouds of incense, Tibetan horns, and an altar filled with bowls of saffron water on which floated little bunches of lavender flowers. The relic exposition was inaugurated in the tent set up for the teachings with a ceremony presided over by Dagri Rinpoche, who had come to see Rinpoche, and our resident teacher, Geshe Tenzin Tenphel.